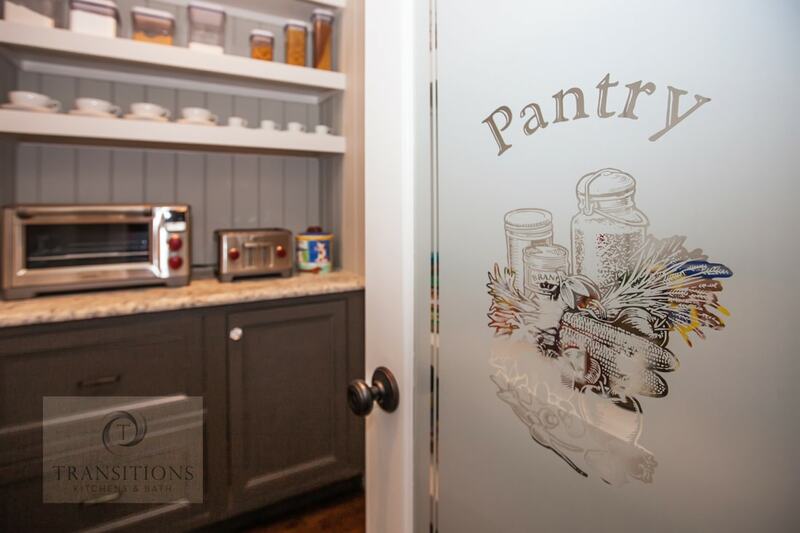 When designing a kitchen, functionality is important as your kitchen design is the hard-working center of the home. 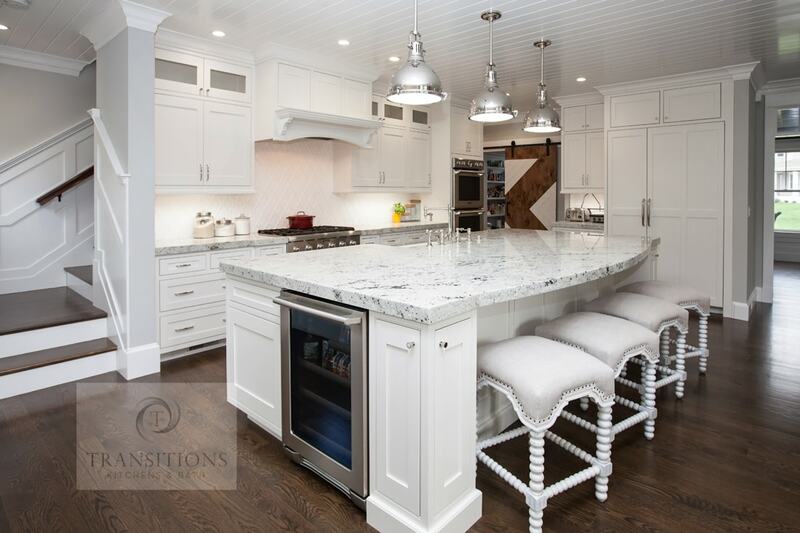 As you plan your kitchen remodel, don’t forget also to inject you and your family’s personalities into the space, otherwise you’ll have a show kitchen that lacks soul. Here are 10 great ideas to put your own stamp on your kitchen during and after the design process. 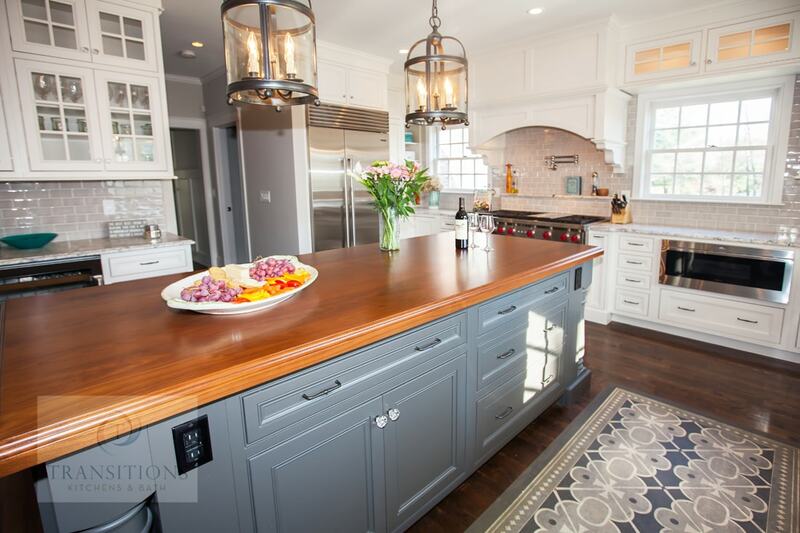 Personalization is huge this season with bold colors, patterns and textures available in all areas of kitchen design, so experiment with contrast and pops of color. Alternatively, go for multiple shades of white, a contemporary dark kitchen, or fashionable two-tone cabinets. Combining colors in kitchen cabinets will give depth and dimension and provide more scope for including your favorite colors. Open-plan kitchen and living areas have plenty of wall space to fill with art. 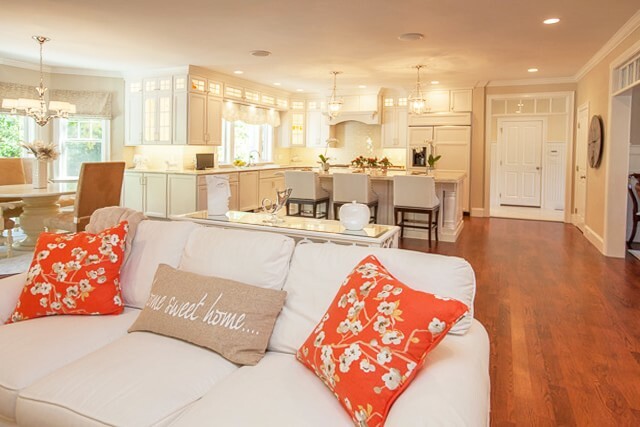 Your choices should reflect your home’s overall style and will influence your kitchen design, from color scheme to how formal you make the space. Why not show a piece of art you love to your kitchen design expert or take it into a showroom with you and let it inspire your new kitchen? 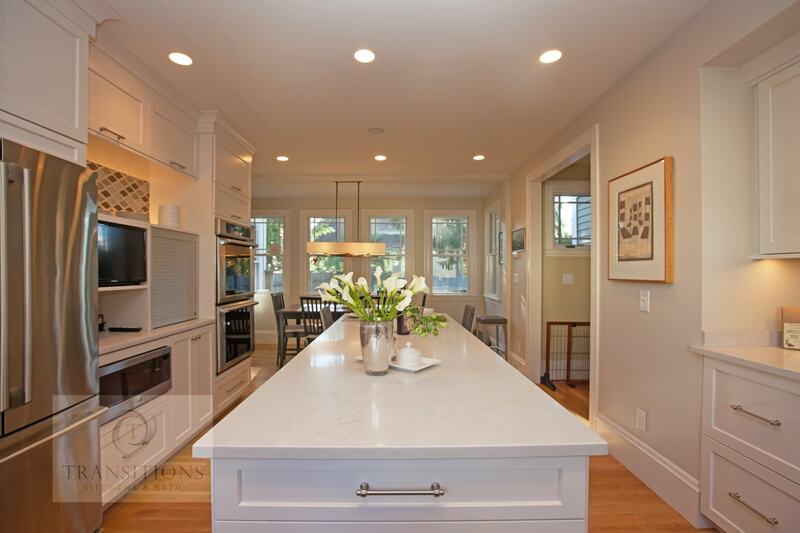 A kitchen remodel should have task and ambient lighting. 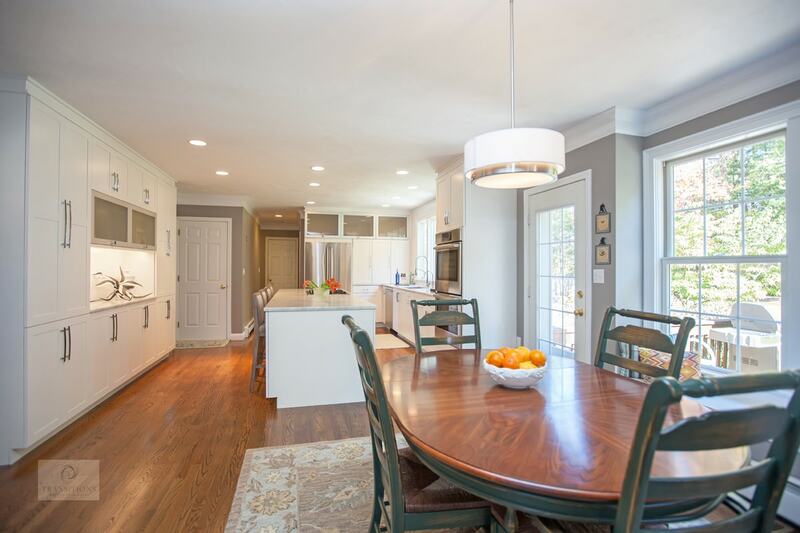 The task lighting must be bright enough and targeted at particular work zones, and other lighting more atmospheric and layered to highlight areas and add dimension to your kitchen design. Decorative light fixtures can serve either purpose, while also adding personality. 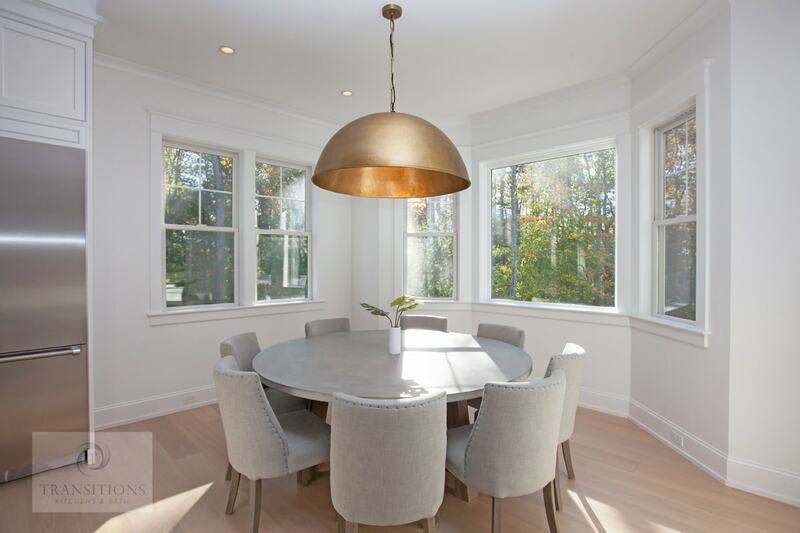 Let an antique lamp illuminate a dark corner, add a contemporary chandelier over your dining table, or include metallic pendants over an island. 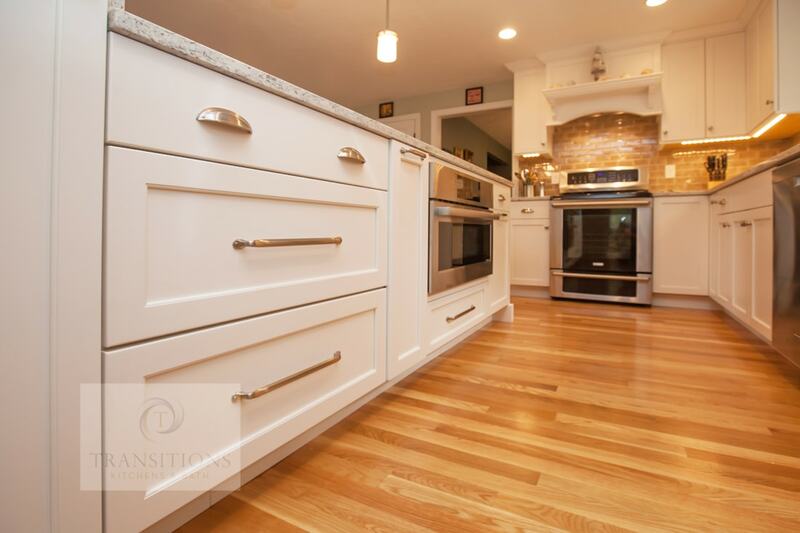 Cabinet hardware is available in a wide array of materials, colors, and styles. Unusual and ornate choices made from contrasting materials such as leather or glass give the element of surprise and uniqueness to kitchen cabinets. Accents of nature are currently big in kitchen design. Plants and flowers bring life and color as they hang or stand in corners. 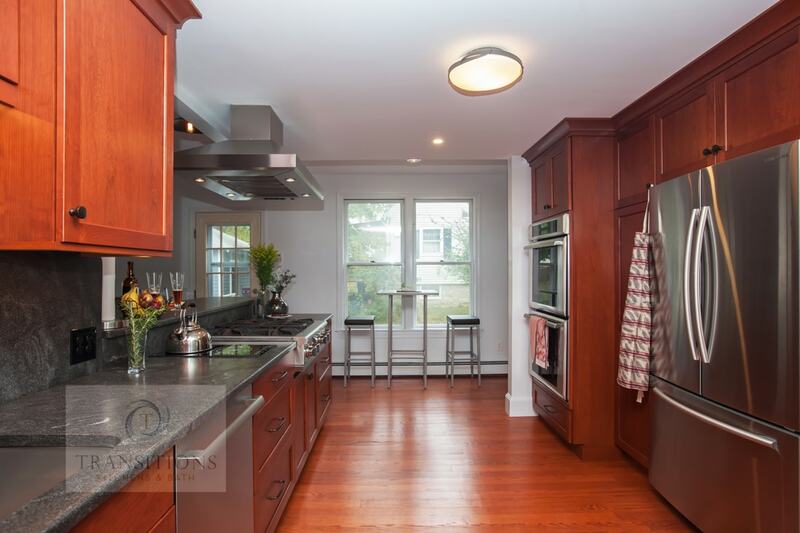 Even cut flowers in a vase bring life to a kitchen island like this kitchen design in Hingham, MA. Bring your kitchen herb garden inside, by placing herbs in sunken troughs built into kitchen counters or hanging on a wall. These living walls are becoming very popular in kitchen design, especially incorporating different colored moss, herbs, and other useful kitchen plants. Earth toned terracotta and shades of green are all-natural tones that are at the center of kitchen color trends this year. Why not choose a fabulous table on commencing your kitchen design? Go with one to reflect your personality and be the focal point, where you’ll have memorable meals with family and friends. Let your kitchen remodel work around the style of the table, with accents complimenting its material or color. Then surround the table with lighting and chairs that can be as sophisticated or eclectic as you like, whatever your personal style. Displaying items such as colorful ceramics or glassware on open shelving or in glass front cabinets really adds personality to a neutral kitchen color scheme. If you want to keep your wall cabinets, then hang some shelving on empty wall space with hooks underneath to display cheerful mugs. Think about whether you want the shelf material to blend with the wall color or cabinet finish, or to make a statement in a contrasting color. 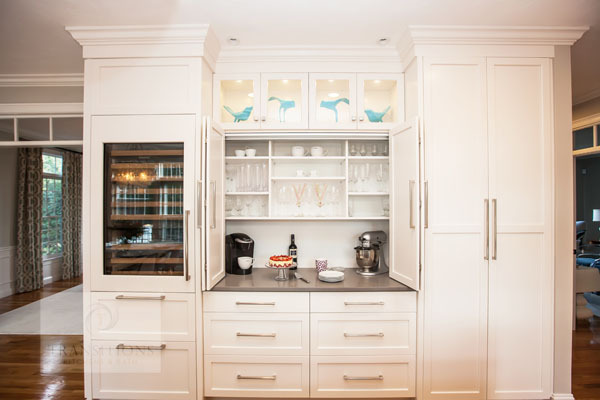 One of the best things about planning a new kitchen design is selecting the bespoke cabinetry to serve your every storage need and look stunning. However, there is always room to incorporate freestanding and vintage furniture in a kitchen design. Use open shelves or glass front kitchen cabinets to display vintage glasses or dishes (whether inherited from your grandmother or found at a local thrift store or flea market). Rugs are perfect for adding color, texture and personality as well as designating areas of your kitchen. Rugs under the table or alongside cooking areas are right on trend, providing the room with color or pattern. If you don’t want a large rug, then try smaller contrasting ones to really jazz up any space, especially in a white kitchen. Appliances come in a huge range of colors and finishes, from metallics giving some edginess, to retro candy hues and pastels. 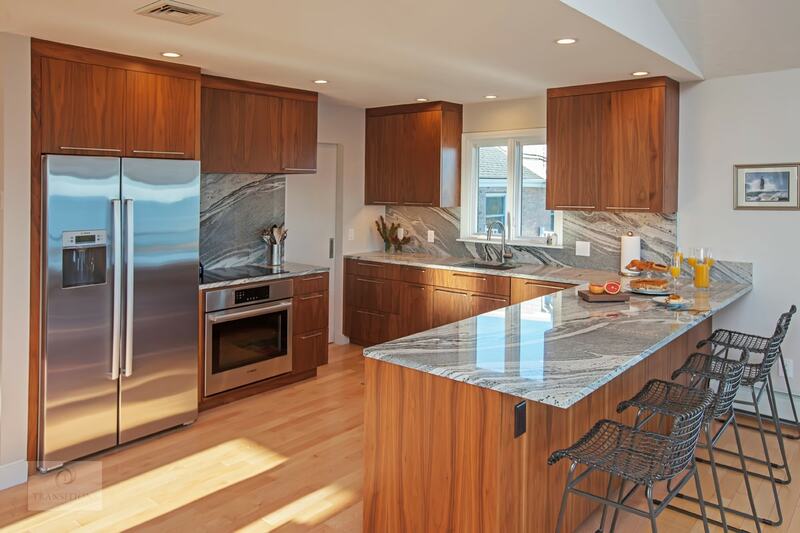 Create a classic look with wood paneled appliances to match cabinets, go sleek and contemporary with stainless, or create a retro or eclectic look with appliances in a vibrant feature color. Although big items like cabinetry and countertops are important, appliances can also inject personality with something as small as an orange food mixer. For further design inspiration check out our gallery or contact our kitchen design experts today who can help you achieve your dream kitchen.